Last month my boss moved his Vectrex game system into my office, and within a week it had moved into my heart. Along with this self-contained vector graphics system, Dave left me a full complement of all of the available cartridges. I was happy to see among other well known names, two of my favorite coin-op titles, Rip-Off and Armor. . Attack. When I actually played them, however, I was elated. Both Rip-Off and Armor. .Attack are adaptations of arcade games originally manufactured by Cinematronics; a coin-op company that filed for Chapter XI bankruptcy back in September of 1982. Regardless of how Cinematronics is doing financially, Vectrex owners can now enjoy the home versions of these two games available from General Consumer Electronics. The name of this cartridge in no way reflects the quality of the product itself. You see, the object of this game is to destroy marauding pirates who attempt to rip off your limited supply of fuel cells. The beauty is that it can be played by a lone player against overwhelming odds, or by two fighters who join forces to repel the computer-driven enemy ships. Either way, the human element is always outnumbered. At the beginning of each game, four or eight (selectable) fuel pods are located in the center of the screen. Your trimlined ship materializes directly to the left or right of these cells. It has the ability to thrust, turn left and right, and fire explosive laser bursts. When the player-ships are in position, the enemy pirate ships begin their onslaught. There are six different types of pirates. As soon as you have destroyed one group, a new backup arrives. Each new type is slightly smarter and significantly faster than its predecessor. If you manage to kill all six groups of pirates, you advance to a higher level in which all of the pirates have increased point values. All of the pirates are capable of stealing cells and firing destructive short range lasers. To steal a fuel pod, a pirate ship must come into contact with the cell, attach a harness to it, and then drive off of the screen. You can save a fuel cell at any time by killing the enemy before it reaches the border. Once a pod has been lost, it can never be recovered. When all of the fuel cells are stolen, the game is over. The thing that sets Rip-Off apart from most other games with two-player options is that in this one, both players are engaged in the game simultaneously. This forces the participants to agree on some ground rules; either they cooperate in the hope of living longer, or they vie greedily for every point. The most common means of destroying pirate ships is to shoot them. It takes but one hit to blast the enemy into moon dust. Luckily, bullets fired from a player ship can destroy only pirate ships. This greatly reduces conflict between players. Sometimes there is no time to aim at a pirate; under such conditions, you must ram the enemy with your craft. Both vehicles will end up as a heap of rubble, but luckily you have an endless supply of ships. Points are awarded for each pirate killed, regardless of whether you shoot the enemy or ram it. The drawback to losing a ship is that it takes a few seconds before you re-enter combat--just long enough for a surviving pirate to run off with a fuel cell. The Vectrex controls make playing Rip-Off especially enjoyable. To turn your ship, you have the choice of using either the small joystick, or buttons 1 and 2. I prefer the buttons because they resemble the coin-op control configuration. If two people are playing, a second controller is required. This is a definite drawback if you don't have an additional controller, but the requirement is clearly stated on the outside of the package. I recommend purchasing a second controller so that you can make full use of games that require two, in addition to having a backup on hand in case something happens to your original joystick. As with all Vectrex games, each cartridge comes complete with a thorough rule book and a color screen overlay. The controls for the game are printed at the bottom of the overlay. This is standard on all Vectrex overlays, and is helpful should you lose the rule book. Unfortunately, the words Player One and Player Two on the Rip-Off overlay obscure the scores on the screen. Since the color overlay doesn't add much to the game, I tend to leave it in the box. The sound effects really round out the game. When two vehicles collide, the vivid graphic explosion is accompanied by a full-bodied crash that actually sounds like an automobile accident. In addition to this, there is a continuous pulsating beat that quickens as the number of remaining fuel cells decreases. During heated action, this tends to match your own heartbeat. To enjoy this game fully, play it with a partner--preferably someone near your own level of skill. Two-player Rip-off is one of my favorite games; I enjoy the feeling of cooperation. Teamwork is essential to good game play. Freedom of control, coupled with 16 game options, make Rip-Off a game of depth with which you will not soon be bored. Since Armor. . Attack originated as a vector graphics game in the arcade halls, it makes a beautiful transition to the Vectrex system. The programmers at GCE sacrificed nothing to bring this exciting tank game to the comfort of your own joystick. You are in charge of a fleet of five missile launching jeeps. After days of fierce fighting, the enemy has finally crushed almost all remaining resistance. By playing a deadly game of cat-and-mouse in the alleyways of a small town, you must hold them off as long as you can; hopefully buying time for your comrades. Your speedy little jeep is very maneuverable and has an incredible amount of firepower for its size. Unfortunately, after your first encounter with an enemy tank, you soon become hopelessly outnumbered. The tanks are heavily armored, which makes them big and slow, but also mandates that you shoot each one twice to incapacitate it thoroughly. The first hit on a tank merely disables it, allowing it to continue to aim and fire at your jeep from a stationary position. A second blast does away with a crippled tank. On the other hand, if your jeep takes one shot, it is obliterated. When all of your jeeps are destroyed, the town falls and the game is over. Luckily, tanks are unbelievably dumb. By passing between two tanks, you can coax them into firing at each other. Tactics such as this can be employed during the first few minutes of play when things are relatively slow. Soon, however, a deadly helicopter comes to the aid of the enemy. While tanks are confined to the same playfield as your jeep, the choppers can fly above the ruined buildings out of your range. You can hit a copter only if it is out in the open, but this usually means placing yourself in a vulnerable position. When helicopters and tanks combine forces, it makes for a very challenging and exciting game. One thing that you may do to even the odds is to enlist the help of an ally. During a two-player game, participants do battle simultaneously; allowing for a great number of strategies to be developed. As in Rip-Off, a second control panel is required for an additional player. As you race through the streets of the village, you can actually hear the squeaking treads of the tanks as they labor in pursuit. The arrival of the helicopter is preceded by the ominous sound of its blades cutting through the smoke-filled air. It is attention to details such as this that makes Armor . . Attack a very captivating game. There are three game options in Armor . . Attack. 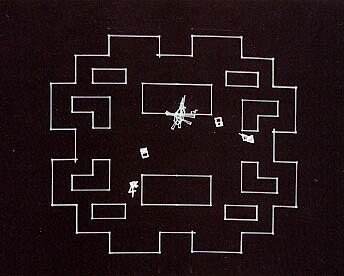 The "normal" mode of play is with the outlines of the buildings drawn on the screen, and buttons 1, and 2 used to fine tune your movement. The second option also has the buildings drawn, but buttons 1 and 2 can be used to steer your jeep instead of the joystick. There is no fine tuning feature. The third mode is similar to the second except that the buildings are invisible. You must know the layout of the town well before you attempt to play this option. Armor . . Attack appeals to players who enjoy longer games that involve realistic settings. Unlike Rip-Off, in which you are under constant pressure knowing that you will eventually lose, Armor . . Attack gives the impression that it can be played for a very long time, as long as you are skilled enough. In the course of reviewing Armor. . Attack, another editor and I spent a considerable amount of time trying many different strategies. Quite by accident we happened upon a discovery that we feel is worth noting. Move your jeep along a wall until it becomes wedged in a corner. Then turn around so that you can shoot at anything that may cross your line of fire. As long as you stay in the corner, you are almost invincible. Enemy tanks and choppers can fire at your position, but for some reason, they have a difficult time hitting you. As the enemy attempts to shoot you, sit tight and pick them off. Although the protection provided by this position is not absolute, I once walked away from the game leaving six jeeps and a score of over 70,000 points. Obviously, there are many similar tricks that help us conquer video games. The above mentioned hint is only an example of the hundreds that are hidden in the games (home, coin-op, computer, and hand-held) that you and I play every day. If you come across a tip, secret, hint, trick, programming bug, or other useful piece of information, write it down and send it to us. We are eager to pass along these secrets, but we need your help. Write down your favorite hint and send it off. Of course, full credit will be given to contributors.